If we talk about the early days, People were so happy with their java based phone as they never feel worried about the battery life of their java phones. Now a days, in the AGE of Smart Phones, every body is worried about their battery life. Actually there are so many functions in today’s Mobile Phones (smartphones) that the battery of any capacity is insufficient to run the phone for a long time. The only thing a person can do, is to learn some battery saver TIPS to save the battery life of the mobile. In addition to the above lines, have you ever experienced that the battery is getting drained very rapidly while you are travelling. The reason for this is the ups and downs of the mobile network signals. These up and downs of the network signals consume a lot of battery life. No worries at all, Today we are here to discuss and share the Battery Saver TIPS to save mobile battery life. We bet, once you go through with all these TIPS and used them while operating your mobiles / smartphones, you are never going to worried about the DAMN battery life of your mobile phones. Below are the most effective Battery Saver TIPS to save the battery life of Android Smartphones. Actually these all are general TIPS and can apply to any of the mobile platform. Other platform too have the same hardware devices and function. So, are you ready to learn the ways to boost battery life of your mobile. Ok, here goes the major doings. 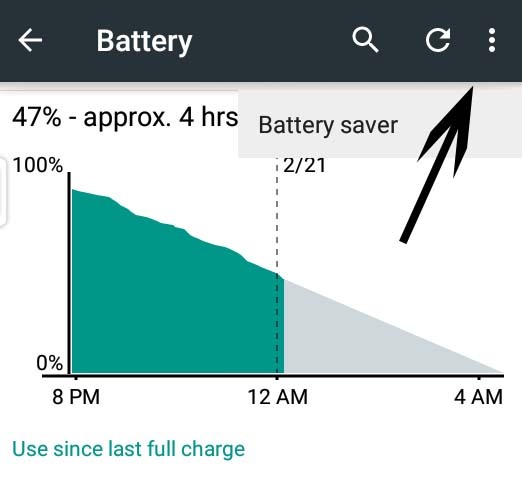 How to Boost the Battery Life of Android Phones / Smartphones USING these Battery Saver Tips. 1)- Using the Screen Light Efficiently. You may have you noticed this many times, that the mobile battery drains very slowly while the phone is locked off. Once you unlock it and start moving the fingers here and there it starts draining quickly. Yes, the screen light is consuming the battery. Here, we are not asking you to stop using the screen light, just asking to use it efficiently, after all we are in the process to save some of the battery life of our mobile. Now what we can do to gain some battery life, ummm …, Below are some tips, you can adopt easily. Tips to use Screen Light in best way. You can apply any dark theme for the mobile, because technically, dark colours uses less battery life in compare to the bright colours. The other thing you can adopt, is to Lock off the phone immediately, when not in use. Suppose you have chosen 60 seconds to automatically turn off the screen lights, when not in use, why to wait for the 60 seconds, do it manually using your fingers. It will save at least some of the battery life of your mobile with a limited battery. You can also use the UC web browser in night mode, not only this will boost up the battery life of the phone, it will also boost up the surfing speed and may help you to reduce some of the mobile data usage too. 2)- By Keeping the Screen Brightness Levels to the Comfort Level. The is the must do activity in the phone if you cares for the battery life of your phone. We have seen plenty of the mobile users, using the default value (100%) under the screen brightness section. Neither they care for their eyes, nor for the battery life. Actually, using 100% of the brightness level in the phone is just like to waste the resources. For better understandings, just adjust the screen brightness level of your phone to the 50% mark and check if you find any difference there, we bet you will not find any. On the other hand your battery will be feeling RELAX now 🙂 . In some exceptions, like standing under the full burning sun, you can set the screen brightness level to 100% as there is no other option to operate the phone under those circumstances. All other time, it has to set under 40% level, in night it has to be under 25%, for any better battery performance. In addition to all the above lines, Now a days, Modern mobiles phone are coming with a light sensor inside them, which adjust the screen brightness levels according to the available light, to the sensor. Below are the instructions about changing your screen brightness levels manually. 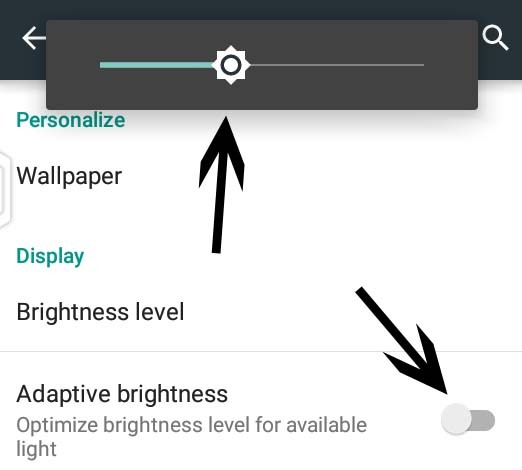 How to change screen brightness levels in Phone. Go to the settings option in the phone, OPEN it. Look for the DISPLAY option, Select it, TAP it to get inside the DISPLAY option. Now check for the option “Brightness Level”, under display. Tap it and have the slider available for you to adjust the brightness levels. Drag it to the minimum, perfect for the readings. In case your phone is packed up with the light sensor, Simply activate the “adaptive brightness” option available under the same display settings. 3)- Always Turn off, Internet Data, Wi-Fi and Bluetooth after USE. In fact, Smartphones are widely used for surfing the Internet and Multimedia Purpose. Most of the People, forget to turn off these related services in their phones and allow them to eat the battery life. Leaving the Internet data to ON position may effect in two ways, will eat out the battery power, and will eat our expensive data from the data pack. Same applies to the Wi-Fi and Bluetooth too, leaving them to ON will surely drain a lot of the battery, in addition there will be some security threats for your Smartphone. Can anybody give any single reason to leave them to ON status after their use. We don’t think anybody has the answer for this. For the sake of the battery life, Do make this habit to turn them OFF, and feel the difference yourself. We hope you have understood the importance to turning OFF all above services after use or when not in use. Don’t put any unnecessary burden on the Wi-Fi and Bluetooth services, to search for the available networks or devices, after regular interval, when you actually don’t need to access them. They will just waste the precious ENERGY, which they will absorb from the helpless battery of the Smartphone. Gotit 🙂 . 4)- Applications are the Offenders. Here comes the main ACCUSE, the installed applications 🙂 . Don’t worry, we will never ask you to stop using any, we will just explain how to use them efficiently. To tell you the truth, almost every Android Application, they comes with the tag of EATING or DRAINING the battery as much as they can. They always have their eye on the status of the data connection, once they see that ON, they just stand up and starts eating the data as well as the Phone’s Battery LIFE. All their activity runs in the background, so the user never get noticed about the burden they are putting on the data connection as well as Phone’s Battery. Applications related to the games get busy in searching for their app updates, apps related to social media get busy in downloading profile data to the phone and bla bla. Just imagine the life of our miserable BATTERY, handling all the processes at the same time, which makes it stucked and out of energy. To relieve this unnecessary load from the Phone’s battery, we have 2 options available. You may select any of them, according to the need and convenience. A)- Using third party applications. To sort out this problem, there are many third party apps available at the play store. Some of them are, Clean Master, ShutApp and DU Battery Saver. Each of these application has the same functionality. Just search their name in the search box at Play Store, install it and look for the option to kill all application, running in the background. Very simple indeed 🙂 . B)- Manually Restricting Applications Background Data. 1)- Open Settings in the phone, Look for the option “Data Usage”, Tap it to open. 2)- Here you will see 3 Vertical dots at Top-Right of the phone’s screen, Tap it to get the option “Restrict app background data”. 3)- After Taping to “Restrict app background data” option, it will ask you to confirm the action. 4)- Supply OK to the Confirmation Popup, that’s it. 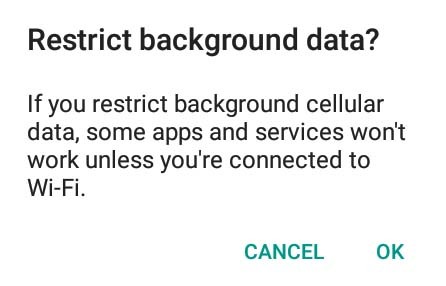 You have successfully restricted apps background data. How to check which Android app is Eating most of the BATTERY. Open Settings in the phone, Look for the option “Power Management”, Tap it to open. Here you will the option, “Battery Usage”. Tap it to open. Now you will have the list of the Android apps, with the % of the battery they are eating against their name. Here, the list starts with the app eating the most of your battery. Note: To check the complete detail about battery usage of any particular app, Just TAP to the app name. 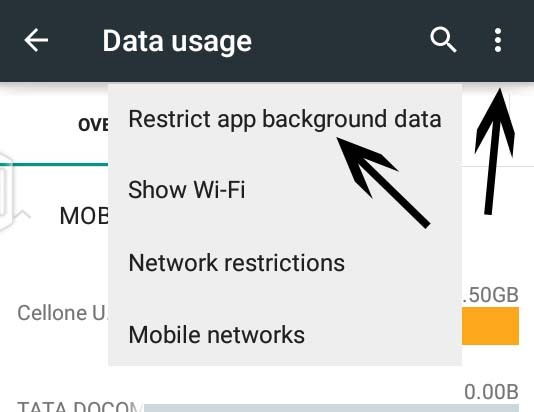 You can also restrict apps background data for any particular app from here itself. 5. Use Aeroplane MODE, While Traveling. As we had discussed earlier, While traveling, due to the ups and downs in the network signals, this process consumes a lot of battery life. Putting the phone to Aeroplane Mode will give us all the phone’s functionality except network signals. Although, we cant talk or surf the internet in this mode, but can enjoy multimedia related processes for a long period of time. Actually this is the basic need of a person, who is traveling. For any urgent need, you always have the option to deactivate this Aeroplane Mode and perform any particular task in the MAIN Mode. Below are the steps to activate the AEROPLANE Mode. 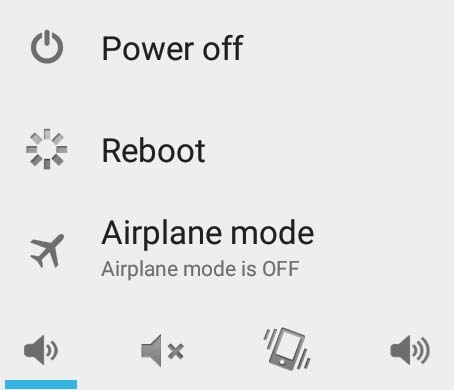 How to activate AEROPLANE Mode in Android Phone / Smartphone. Hold the Power button of the Phone for few seconds. A popup windows will appear, with 3 options. As you can see, the last option is AEROPLANE Mode, Tap it to Activate. That’s it, Enjoy listening to the songs or watching movies. Oh yot to play thu wane games. No worries, go ahead and stop worrying about the battery life 🙂 . Note: Repeat all the steps to get back into the MAIN Mode. Isn’t that’s simple and useful. 6)- Always use “Battery Saver Mode”. In actual, this Battery Saver Mode is all about the compromise of appearance over the performance. This option is newly added to the Android Operating System and is available from Android 4.0 and later versions. This Battery Saver Mode works automatically, when the Android System sense that the battery is really getting too low. It stops all the processes that consumes a lot of battery Life. This again is a must use option while traveling. DO you agree or not ?. Below are the instructions to activate it. How to activate Battery Saver Mode in Android Phone. 1)- Open Settings in the phone, Look for the option “Battery”, Tap it to open. 2)- Here you will see 3 Vertical dots at Top-Right of the phone’s screen, Tap it to get the option “Battery Saver”. 3)- After getting into the Battery Saver option, Just drag the slider from Off to ON and Battery Saver mode will be active from that moment. 4)- You may also tune the “Turn on Automatically” option there. The default value is “never”, You may select to “Turn on Automatically” at 5% battery OR 15% battery. Note: It may effect the appearance of the phone, but will surely boost the battery Life of the Android Smartphone. 7)- Disable Location for the Phone. 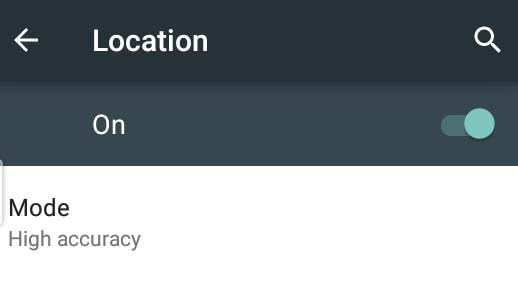 Generally, this location service is used while navigating Google Map Service to get any of the directions. Why to use it all the time ?, it is also a unnecessary burden on our phone, which effects the performance directly, especially our battery life. Don’t worry about navigating Google Maps to get any directions, as you can enable it anytime or at the time of navigating the Google Maps. Below are the instruction to disable location service. Open Setting in the Phone, Look for the “Location” option. Now, drag the slider from ON to OFF, that’s it. Don’t you think, this is the simplest tweak to save battery life of any Android Phone. Note: We hope there is no need to instruct about how to enable it again. 🙂 . 8)- Others Battery Saver Tips for Android Phones. 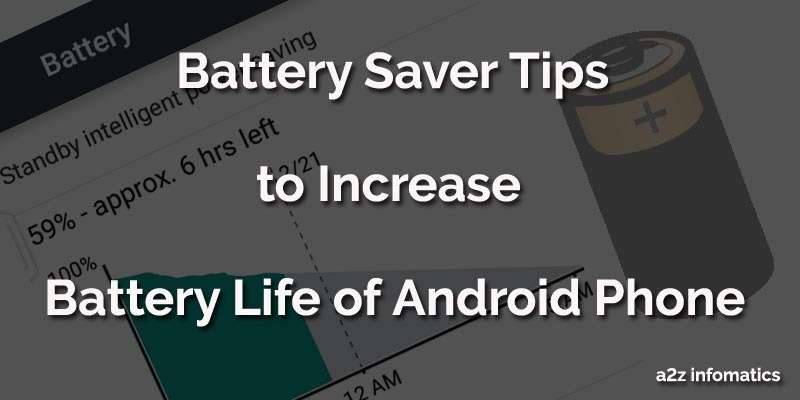 Although, only the above TIPS will leave a great impact on the Battery Life of the Android Smartphones, below are some more TIPS which may effect the Battery Life under many circumstances, we think you have to understand all of them for the better knowledge about the topic, Battery Saver Tips. We recommend you to at least give a try to all of them and feel the difference 🙂 . Avoid using Vibration with Balanced Ringing Volume. Camera consumes a lot of battery, why to use it all the time. Ignore Flash, where ever possible. Control your Multimedia related operation in the Phone. The last but not the least, Cut down the incoming / outgoing call time period. 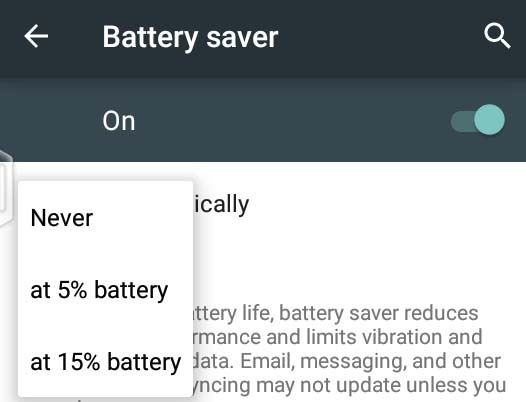 So Today, You have learned about How-to save the battery life of your Android Smartphone using some easy Battery Saver TIPS and TWEAKS. We hope everybody will implement these TIPS while operating their devices. We understand, it will surely effect the functionality and appearance of the phone, but you can at least use them while travelling or at any place where the charging option not available to you. To tell you the truth, we always use, all of them, as we cares for the Battery Life of our Phone. Don’t you care for your’s ?. Oh, one thing left, never, ever use the phone while it’s charging. Ok that’s all we have related to the battery saver TIPS, if anybody wants to share any more tip related to the same, he / she can share that using the comments section below. Thanks for visiting. Stay Blessed and Take Good Care of Yourself.